Sidney and Stella do everything together . . . except share! Twins Sidney and Stella love doing everything together. Everything except share. When a quarrel over a bouncy ball spells cosmic disaster, the twins must face their biggest-ever challenge: working together to find a new moon! Emma Yarlett graduated with honors in illustration from University College Falmouth in 2011. Her other work includes a nonfiction book by Julia Donaldson and animation for the Waterstones Children’s Book Award. Amusing. ... Full of playful design elements that make reading it a visual pleasure. Yarlett’s cartoonish digital collages, speech balloons, and font size and style variations offer a plethora of hilarious details that enrich this imaginative story. Fans of Oliver Jeffers and Mini Grey should enjoy this short but comical romp, and all readers will benefit from a story about sharing that isn’t heavy-handed or overly moralizing. 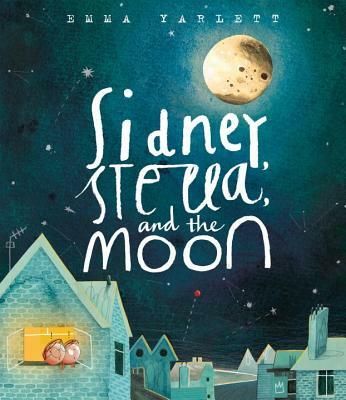 How Sidney and Stella learn to cooperate and get a substitute moon in place forms the wonderfully silly resolution. The digital artwork allows for suitably surreal touches, making this an off-kilter, offbeat choice for similarly off-the-beaten-path kids. Adorable and interactive, the story's illustrations are indespensible. The suspense, hilarity, and playfulness of the text and art inspire children to find creative solutions to problems and to discover joy (and pride) in working together.